Join us Thursday April 20, 7:00pm – 8:45pm for the next Around-the-World Fiddle practice session! Arrive a bit early 6.45 to ask questions, get information, memberships, workshop registrations and dinner tickets and to get set to go for 7pm. Even better you get to play with a group of people who are keen on world fiddle music. Anne Lederman leads this session and will take you through the rhythm, chords and melodies of the tunes. Long&McQuade, 935 Bloor St. West, look for the Clinic door, go up the stairs. This Thursday we’ll look at the two tunes from Scandinavia and the Middle East. “Josefin’s Waltz” has become a Canadian fiddle jam favourite. “Finnish Polska” a fun to play tune arranged by Lassi Logren, from his book Stemmasoittoa Viululla. “Alhamdoullilah’ a traditional Arabic song was our theme song from 2016. This song made a splash on CBC National Television in 2016 when an Ottawa school choir sang it in honour of our Syrian refugees, with it’s combination of Arabic and French. “Uskudar” is a Turkish folk song about a woman and her clerk (kâtip) traveling to Üsküdar. The tune is a famous Istanbul türkü fold song. 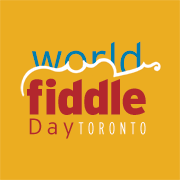 World Fiddle Day May 20th, 2017 is coming up soon at the Aga Khan. We recommend the membership deal: for $60 you get the World Fiddle Day 2017 tunes book, workshops and evening concert all inclusive. FREE for all under 25. Workshops spaces are limited to 20 people, members can sign up for workshops until May 5, After that workshop registration is open to the public. Bring your friends and family to the event! Non-members attend the jam for free – evening concert tickets extra. Check the website for more information or drop in to our Around-the-World Jam practice for more information. Middle Eastern Buffet Dinner tickets are available until May 5th. Anne. Would you please send directions by bus on how to get to the centre. I misplaced original directions . Thanks. I hope we replied to this previously, if not please accept my apologies. To get to clinic space at Long and Mcquade take the subway to Ossington Station and then cross to the south side of Bloor and walk west a block on Bloor; you’ll see the signs for Long and Mcquade’s, at the end of their series of shops is the door to the clinic space upstairs. The next practice session is April 30, 1-3.30 pm.